George Govorov, the future Saint Theophan, was born on January 10, 1815 in the village of Chernavsk in the Orlov province where his father was a priest. At first, George attended a primary school at Liven, then a military school. From 1837-1841 he studied at the Kiev Theological Academy, and probably visited the Monastery of the Caves several times. In these surroundings, it was not surprising that he received the monastic tonsure while he was still a student. After graduation Hieromonk Theophan was appointed rector of Kiev’s church schools, and later became rector of the seminary in Novgorod. Before he retired from teaching, Father Theophan served as a professor and Assistant Inspector at the Petersburg Academy. Saint Theophan was not complely happy with academic work, so he asked to be relieved of his duties. He was assigned to be a member of the Russian Mission in Jerusalem. After being raised to the rank of Archimandrite, he became Rector of Olnets Seminary. Soon he was assigned as the chief priest of the embassy church in Constantinople. Saint Theophan was eventually recalled to Russia to become rector of the Petersburg Academy, and supervisor of religious education in the capital’s secular schools. On May 9, 1859 Saint Theophan was consecrated as Bishop of Tambov, where he established a diocesan school for girls. During his time in Tambov he came to love the secluded Vysha Monastery in his diocese. In 1863 he was transferred to Vladimir and remained there for three years. He also established a diocesan school for girls at Vladimir. The holy bishop visited parishes throughout his diocese serving, preaching, restoring churches, and sharing the joys and sorrows of his flock. It was very difficult for Bishop Theophan to live in the world and become involved with vain worldly disputes. Many abused his trust, but he could not bring himself to chastise anyone. Instead, he left left such unpleasant tasks to the Archpriest of his cathedral. He was present at the uncovering of the relics of Saint Tikhon of Zadonsk in 1861, and this made a tremendous impression on him, for he had much in common with that saint. He had loved Saint Tikhon from early childhood, and always spoke about him with great enthusiasm. When Saint Tikhon was glorified as a saint on August 13, Bishop Theophan’s joy knew no bounds. In 1866 his request to be relieved of his duties as Bishop of Vladimir was granted. He was appointed as Superior of the Vysha Monastery, but soon resigned from that position. He was permitted to live there and to celebrate services whenever he wished. He also received a pension of 1000 rubles. As he prepared to leave his diocese, he wished to focus on his own salvation, and to concentrate on undisturbed communion with God. On July 24, 1866 he bade his diocese farewell, leaving the world for a life of reclusion, and to devote himself to writing spiritual books. Through these books, Saint Theophan has become the spiritual benefector of all Orthodox Christians. Although he sought the Kingdom of God and His righteousness (Mt. 6:33), a reputation as a writer of great significance for the whole world was also added to him. 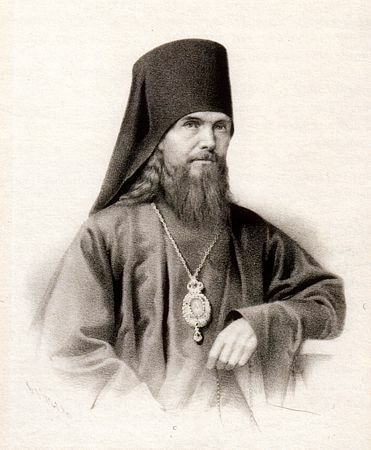 Bishop Theophan wrote many books, but received no profits from their sale. He tried to keep them as inexpensive as possible, and they quickly sold out. He wrote about topics which others before him had not fully treated, such as how to live a Christian life, how to overcome sinful habits, and how to avoid despair. He tried to explain the steps of spiritual perfection systematically, as one who had himself gone through these various steps. Some of his books include THE SPIRITUAL LIFE AND HOW TO BE ATTUNED TO IT, THE PATH TO SALVATION, and LETTERS ON THE SPIRITUAL LIFE. He also translated the PHILOKALIA in five volumes, and THE SERMONS OF ST SIMEON THE NEW THEOLOGIAN. For the first six years in the monastery, Bishop Theophan attended all the services, including the early Liturgy. He stood still in church with his eyes closed so that he would not be distracted. He often celebrated Liturgy on Sundays and Feast Days. Beginning in 1872, he cut off all relationships with people (except for his confessor) and no longer left his cell to attend church. He built a small chapel in his quarters and dedicated it to the Lord’s Baptism. For ten years he served there on Sundays and Feast Days. For the last eleven years of his life he served every day by himself. Sometimes he would sing, and sometimes he kept completely silent. Whenever anyone visited him on business, Bishop Theophan would reply with as few words as possible, then immerse himself in prayer. If anyone sent him money, he would distribute it to the poor, keeping only a small portion to purchase books. Whenever he was not occupied with writing or praying, the reclusive bishop worked at carpentry or painting icons. He received from twenty to forty letters each day, and he answered all of them. He was able to discern each writer’s spiritual condition, then give detailed answers to the questions of those who were struggling for the salvation of their souls. His eyesight deteriorated in his latter years, but he did not curtail his work because of it. In the evening, his cell attendant would prepare everything for the bishop to serve Liturgy the next morning. After finishing the Liturgy, Bishop Theophan would knock on the wall to signal the cell attendant to serve him tea. On days when there was no fasting, he would eat lunch at 1:00 P.M. This consisted of one egg and a glass of milk. At four o’clock he would have some tea, and then no more food that day. Bishop Theophan began to get weaker at the beginning of 1894. He was still writing on the afternoon of January 6, but when the cell attendant came to check on him at 4:30 he found that the bishop had departed to the Lord. Saint Theophan’s body lay in the small church in his cell for three days, then three more days in the cathedral. There was no trace of corruption, however. He was laid to rest in the Kazan church of the Vysha Monastery. Several of Saint Theophan’s books have been translated into English, and are reliable spiritual guides for Orthodox Christians of today. Saint Theophan’s gift was the ability to present the wisdom of the Fathers in terms which modern people can understand. Since he lived close to our own time, many readers find his books “more approachable” than the earlier patristic literature. He treats the life of the soul and the life of the body as a unified whole, not as two separate elements, and reveals to people the path of salvation.